Q: I lease an older horse that’s a retired jumper. He’s a good boy but he holds his head really high. I spend lots of time on flatwork between my lessons and I’m good with my hands. Why does he still hold his head up? How can I get him to lower his head? I really don’t want to resort to draw reins or martingales. A: Horses can develop a high headset for numerous reasons. One is conformation. A horse whose neck naturally arches upward is destined to have a more uphill frame or self-carriage than a horse with a lower neck set. To see this difference, study the physical build of an American Saddlebred compared to an American Quarter Horse. Another reason for high-headedness is learned behavior. Over time, a horse that is ridden with rough hands or an overly severe bit becomes protective of its mouth. The horse learns that it can evade the effect of the bit and the rider’s hands by lifting its head. Also, training practices come into play. A show jumper, for example, is schooled to keep its weight back on its hindquarters so it can more easily lift its front end over the jumps. Finally, poor saddle fit or a chronically sore back can cause a horse to elevate its head and hollow its back to escape the discomfort. Some or all of these reasons could have contributed to your horse’s high head set. Ask your instructor’s opinion on these possible factors, and how they might be addressed. You can indeed help fix the problem between lessons without using artificial training devices. 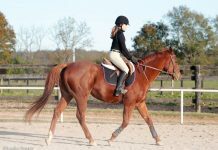 Providing your horse doesn’t suffer from a soundness issue, stick to your flatwork routine. First equip him in the mildest bit required to maintain control. Ideally that would be some sort of snaffle. Then utilize lots of patterns that incorporate lateral bends. Use lots of figure-eights, serpentines and simple half-turns. Ride deeply into every corner, asking him to bend in the proper direction. Press with your inside leg behind the girth so you have the sensation of pushing his energy onto your outside rein. You must be ready to reward any inch of compliance by pushing your inside hand forward toward his mouth, essentially “giving” him the bit. This slight relaxation of your hand encourages him to reach for the bit even further, which in turn will lower his headset. As your gelding learns to supple his neck from left to right he’ll also begin to become supple vertically. That is, as he begins to bend and flex side to side, his neck will lengthen and his head will drop, too. Again, be prepared to reward his effort by softening your contact ever so slightly, even if it’s just for a few strides. 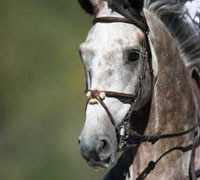 Because your horse is older, and probably a little set in his ways, this program will take time. And he’ll probably never carry himself like a hunter under saddle. But if you’re consistent and patient, he’ll learn to relax, trust your hands, and lower his head. Great advice. I’ve ridden two horses that really had a problem with this. I used a running martingale on one with great success. The other just naturally held her head high and even hit me in the face a few times because of it. Each horse is so different. Follow this advice, I have a gaited mare who held her head high (and tight) too. This same advice was given to me by my wise instructor who, if she can, also avoids such contraptions. It worked for her, she now relaxs into the bit. I agre with the others, this article is good advice. Worth rereading.